The Romeo men's leather ballet shoes were designed just for men! 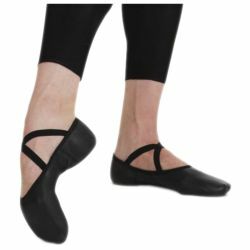 They are perfect for male ballet dancers of all skill levels. The Romeo men's leather ballet shoes feature soft and durable sheep skin glove leather, a split sole, diamond gusset for a seamless and sculpted arch, moisture absorbent polyester/cotton lining, precision trimmed fore foot padding, bar-tacked elastic, contoured suede sole patches, and elastic on the heel. The shoes are available in black only, adult men's shoe size 7 – 12. Order your street shoe size. Use the drop-down box below to select a size.